Blind Biologist Finds Clues to Human Societies in Shells California professor Gary Vermeij thinks he's found clues to the power of nations and multinational corporations -- by studying seashells. During his 35-year career, this biologist has overcome significant obstacles to carry out his research. He has been blind since age 3. California professor Gary Vermeij thinks he's found clues to the power of nations and multinational corporations — by studying seashells. During his 35-year career, this biologist has overcome significant obstacles to carry out his research. He has been blind since age 3. A California professor thinks he's found clues to the power of nations and multinational corporations by studying sea shells. His research suggests that the big and powerful have gradually become more powerful over time, and that biological law applies to human endeavors as well. He based his research on the kind of shells you might find during a stroll on the beach, and his extraordinary finding only becomes more remarkable when you consider the way this man has conducted research during his 35-year career. Here's NPR's Richard Harris. The University of California at Davis is as flat as the Plains, and the concrete hulk of a geology building doesn't obviously inspire big ideas, but don't be fooled. Mr. GEERAT VERMEIJ (University of California at Davis): Hello? Mr. VERMEIJ: Hi. Good morning. Mr. VERMEIJ: Very well, thanks. HARRIS: Geerat Vermeij is wearing a wool sweater, a wispy beard and a warm smile as he welcomes us into his office. The room is packed with row upon row of metal cabinets filled with sea shells. Mr. VERMEIJ: We've got marvelous things here. HARRIS: They range from clams as heavy as bowling balls to shells so small, they're kept in little bottles, and others that are impossibly skinny. Mr. VERMEIJ: Just look at that. I mean, that's--it's so--it's like a needle. Mr. VERMEIJ: It's so thin, it's hard to imagine how a snail could ever live in that shell. This is a Terebra triserialis, from New Guinea. Wonderful thing, isn't it? I mean, just so unlikely. That's one of the things I just love about this. You get to see shapes that you would never imagine in fiction, but they're real, and so you have to try to explain them. HARRIS: With childlike excitement, Vermeij dives into another cabinet, more than happy to show off bizarre and wondrous shells that, in his hands, tell rich and interesting stories. Mr. VERMEIJ: I'll show you some snails on the other side here. HARRIS: Vermeij has collected most of these shells himself. His travels have ranged from the slippery rocks of the Aleutian Islands to Panama. He rummages around for one memorable shell that he collected on Morea, near Tahiti. Mr. VERMEIJ: I stuck my hand, as I always do, in a little hole in a rock on a very wave-washed reef crest, and I was pretty sure there was going to be a snail there, but--and there was, in fact. However, there was also a moray eel, and so it gave me a pretty good bite, but I did retrieve this specimen nonetheless. So I remember this one more or less fondly. HARRIS: Vermeij didn't see that eel, and he can't see his beautiful shells, either. He has been blind since the age of three. 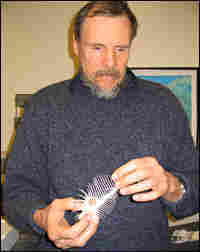 He studies shells by turning them over in his hands and probing them with his fingertips and fingernails. Mr. VERMEIJ: I can have held a shell for 10, 15, 20 times and still find new features that I hadn't really observed before. There are so many details that are easy to miss. I think that frankly, the same thing would be true of people looking at specimens. There's almost always so much more there than you might think. HARRIS: Vermeij's sense of touch has led him to understand not only individual shells but the sweep of evolution. One story he tells has to do with some snail shells he found in Guam many years ago. They are so unappealing, most people would never have thought to stop and pick them up in the first place. Mr. VERMEIJ: There's a whole box full of broken, terrible shells. And these are really just fragments, but they looked really fresh. They looked as if they'd been killed yesterday. HARRIS: Vermeij came to appreciate that these snails had been victims of fierce predacious crabs, but he also found shells that had merely been scarred. The snail was able to repair that damage and live on. Mr. VERMEIJ: What then occurred to me is that, well, we can see this in living snails, we can see it in fossil snails, and we do. We see lots of fossil shells, even very ancient shells, that have this kind of damage. And so you can learn something about the conditions of life hundreds of millions of years ago by examining and counting these repaired breaks. HARRIS: By counting these scars in all sorts of fossil shells and modern shells from around the world, Vermeij came to a startling conclusion. Over millions of years, predators have been gradually gaining the upper hand. The powerful have become even more powerful. Power begets more power. Vermeij argues that principle also applies to human constructs, like nations and corporations. We decide to continue that conversation at his house. Geerat Vermeij walks with as much determination and purpose as he pursues his science. He says he prefers a nice long cane because he can walk faster with it. Mr. VERMEIJ: I think if I drove, I would get tickets all the time. Mrs. EDITH VERMEIJ (Wife of Geerat Vermeij): Hi. Mr. VERMEIJ: This is Edith, my wife. HARRIS: Edith is his sounding board, at times his collaborator and for 35 years, his eyes into the world of the scientific literature. Before lunch, Vermeij settles down in front of a 40-year-old Braille typewriter, and Edith picks up a scientific journal. Mr. VERMEIJ: OK. This is what I call reading the literature. HARRIS: Edith and other readers spend hours each day with Vermeij as he scours not only scientific journals but economic texts and other books as well. There's essentially no Braille literature in biology other than what he himself creates. Mr. VERMEIJ: This is a good Darjeeling tea from Pete's. HARRIS: Vermeij heads to the kitchen to make a pot of tea and to offer us Windmill Cookies imported from Holland, where he was born and where he lived until he was nearly nine. Mr. VERMEIJ: We call them (foreign language spoken). These are wonderful things. I was very partial. HARRIS: Mm, they are wonderful. HARRIS: He deftly pours cups of tea and settles into a comfortable chair. Vermeij says blindness is a characteristic he's adapted to, but it's not a central focus of his life. Mr. VERMEIJ: Most people who try to imagine what it's like to be blind think of blackness, and, you know, that's just not the right analogy. The world for me is not black. In fact, it's very much the opposite for me because I hear all kinds of wonderful sounds. I can feel all kinds of wonderful things. I smell wonderful things. I taste nice things. So for me, the world has not lost any of its beauty or its appeal or its challenge just because I happen to be blind. HARRIS: Vermeij says, in fact, being blind actually heightened his sense of awareness and helped him turn his deep childhood curiosity into a scientific career. Mr. VERMEIJ: In fact, being aware, to me, is so essential in science because by being aware, you're made a better observer, and observation is where really all of it begins, to me. If you don't observe, then it's very hard to be puzzled by anything. If you're not puzzled by anything, then how can you ask scientific questions? HARRIS: His scientific curiosity gradually drew him from the seashore to the greater world of human affairs. He believes the principles he sees in mollusk evolution apply as well to Microsoft and McDonald's. Vermeij realizes that he's going out on a bit of limb to use evolutionary principles to explain human societies and human behavior. Mr. VERMEIJ: On the other hand, it's the same to me as taking risks in the field, if one is collecting or observing marine life in what is ultimately a very dangerous place. If you don't take academic or intellectual risks, you're not going to be very interesting. Mr. VERMEIJ: I think the jury's really out on that one, because to my knowledge, there are very, very, very, very few blind scientists, certainly no one in my field. HARRIS: Sure, there are challenges, but Geerat Vermeij's career shows just how much a person can accomplish with passion, determination and razor-sharp wit.